To be fair, Dave’s cartoon doesn’t specify whether there is anything alcoholic in the minibar. I had assumed there was some nice sparkling water and some fruit pressés. It’s amazing what our minds introduce into our interpretations, isn’t it? Pete- to be fair, neither of us know what is contained behind the minibar door. In the US at least, a minibar is always stocked with alcohol…..and over-priced nuts. But Jesus proclaimed the gospel while drinking – wedding at Cana and the Last Supper spring to mind. He was always eating and drinking with people. Good point Miriammoules. What I would say is that my post has nothing to do with whether or not drinking is something that should be abstained from. My post was about the attitude in the Episcopal church around alcohol- that drinking is something to be joked about. My point is that alcohol consumption is something that the church should be taking seriously- and not treating as a joke. And as a priest- joking about clergy drinking while preaching is of poor taste. But seriously, when shocking parishioner’s in their pews becomes as big of an issue as alcoholism is in the Episcopal Church, I’ll write about it. I don’t see this as a joke about alcohol at all. The whole tenor of the cartoon is the surrealism of what you could get on a pulpit. And it really is very funny. I’d have a hard time guessing which bit is best out of the various volume controls, the ‘clap of thunder’ button and the emergency cord. Dave (no relation) is an outstanding cartoonist and this is the heart of his humour – making the mundane bizarre and exciting. When we see his cartoons, we share in sending ourselves up, so if anythimg, he is saying how we *don’t* ever stop a sermon for a mini-bar break, just as we never take a stairlift up the pulpit steps or send an electric shock to a pew of worshipppers. Literalism without context can lead to missing the point entirely. So I have tried to find out if Dave Walker, the cartoonist of no relation to you, is an Episcopalian. I can’t get to his blog. So who knows. But I do know that how this cartoon came to my attention was because Episcopalians of every kind (lay and ordained) were posting it all over Facebook. To be clear: I’m not all that concerned with what the artist’s intent is. What I am concerned with is that Episcopalians continue to further the stereotype that we are intimately linked with alcohol- and I am not talking about the sacraments. From stand-up to cartoons to knock-knock jokes, Episcopalians and alcohol get linked together. I think this relationship, often reinforced with little to no thought, is unhealthy. Not only do I think the Episcopal church has more to offer the world than a stiff drink, but I have seen the dangerous and serious effects of alcohol in the church. And that just isn’t funny to me. 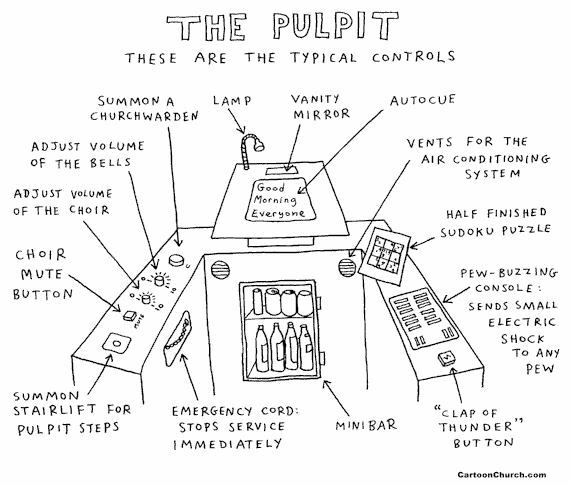 I know full well that if a priest were to install a minibar in the pulpit their call would be dissolved. My concern is for the priest with a fifth in their desk drawer and the lay person struggling with sobriety. Dave Walker is British, not sure if he’s Anglican, but there isn’t, to my knowledge at least, the same situation with alcoholism in the church here. For what it’s worth, I witnessed the effects of the illness of alcoholism first hand as a child, and I found the idea of getting shedded in the pulpit as surrealy funny as zapping snoozing parishioners while I’m delivering a snore fest homily. He is English and an Anglican. Today he tweeted a new book out: http://www.chbookshop.co.uk/books/9781848258204/heroes-of-the-coffee-rota. I had no idea that Episcopalians had some kind of reputation with alcohol. I think Dave’s work has got caught in the crossfire from some personal sensitivities. I don’t think many people wil look at this and think of drinking preachers. They’ll just love the humour and look for the next cartoon. I’ve seen other cartoon’s of his- he is very funny and I wish him the best of luck with his book. Dave Walker is a member of the Church of England. His work occurs regularly in the Church Times. The same cartoon hangs in the parish office of my church. It’s one of the first things a visitor sees. I don’t believe this is really what we want the first impression to be– a joke about the Episcopal Church and alcohol. Our parish hall serves as a meeting place for AA every day of the week, and Al-Anon once a week, yet we never ever have a parish gathering without alcohol, and we hang a cartoon up that reinforces the impression insiders and outsiders alike have about the Episcopal Church and alcohol. Thankfully General Convention addressed the need to set some guidelines for alcohol in the context of parish gatherings. Long overdue. Still, I’m grateful the work has begun. Rev. Katie, thanks for posting. I am not against drinking alcohol. I don’t believe it’s a sin, especially since Jesus turned water into wine for purely recreational purposes. However, I do cringe a bit when I hear jokes made about drinking, cocktails, etc. by our Episcopal leadership. In our family, substance abuse has caused pain. I choose not to drink in support of family that suffer from addiction and because alcohol represents pain to me and not celebration or relaxation. That is my personal issue, I realize, but I don’t think I am alone. And, in an effort to recognize that many have painful experiences associated with alcohol, I do wish that our leaders would be a bit more mindful about their language around alcohol. I do appreciate that St. Mary’s policy is that alcohol is not served at any gatherings where children are present.